Did you know that clicking a ‘Like’ button on Facebook could determine whether you’re gay or straight, liberal or conservative, intelligent or not so much — even if you didn’t intend to? Researchers ran tens of thousands of Facebook profiles and questionnaires through a computer algorithm to find the obvious traits, as well as the not-so-obvious connections. The results of the research have been posted in the Proceedings of the National Academy of Sciences this past Monday. If you would like to sample the method for yourself, you can check it out at YouAreWhatYouLike. Some of the results are pretty obvious, meaning if you ‘like’ a page called “I’m Proud to be a Christian”, it’s pretty obvious that you are a Christian. The computer model puts “Sometimes I Just Lay in Bed and Think About Life” into the category for homosexual females, while “Thinking of Something and Laughing Alone” is linked to heterosexual females. 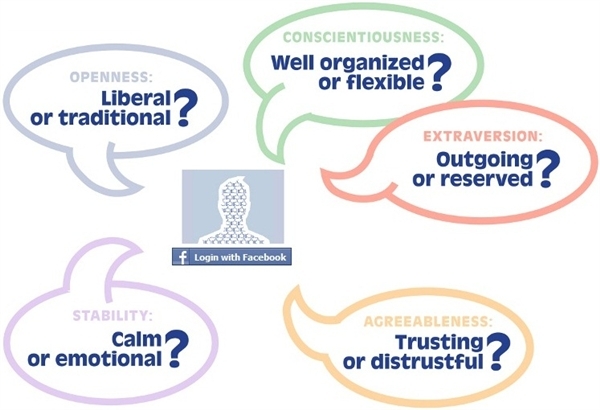 The results were analyzed to produce correlations in more than a dozen categories, including five different personality attributes (openness, conscientiousness, extraversion, agreeableness and emotional stability), which were the attributes analyzed on the “You Are What You Like” website. The other categories included IQ, religion, politics, sexual orientation, age, gender, race, relationship status, alcohol and drug use, tobacco use, life satisfaction, number of friends — and even whether a Facebook user’s parents had separated by the time the user was 21. Wow! The researchers’ computer model provided the best match at predicting black-vs.-white and male-vs.-female (95 and 93 percent accuracy, respectively). The computer model could also correctly distinguish between Republicans and Democrats 85 percent of the time and between Muslims and Christians 82 percent of the time. The accuracy rates for predicting sexual orientation were 88 percent for males and 75 percent for females. You would think that reaching a result of homosexuality was easily determined by clicking the ‘like’ button for “Gay Marriage.” However, less than five percent of the gay users were fans of such an obvious page. For example, the computer model correlated the fan pages for Kathy Griffin and “Wicked, The Musical” with homosexual males, while matching heterosexual males to the pages for Bruce Lee and WWE wrestling. Perhaps this will create a technophobia for many of you, or even so much as a Facebookophobia specifically due to the feeling of being violated by a computer program possibly determining your race, ethnicity or sexual preference. This type of program makes me ask about the ethics and privacy of doing something like this. Only about half of the survey takers (which was around 8 million total takers) gave their approval for their results to be matched with Facebook ‘likes’ on an anonymous basis, and of those, about 58,000 profiles were used for matching. If your Facebook profile privacy settings are set to ‘public’, any of your page ‘like’ information could be sharing very private details with all sorts of researchers and marketers. Think about how marketers could use that private information to market to you. How would you feel if you were a heterosexual male who had clicked that you liked Kathy Griffin because you thought she was pretty, and in return received numerous ads on your Facebook page for homosexual products and events? And then your wife sits down at the computer as soon as you get up to get a snack…how do you explain that to her? Personally, I think this is going too far and invading the privacy of social media users. What are your thoughts? Have marketers and researchers taken this too far? Is this unethical marketing? This entry was posted in Emerging Media and tagged ethics, Facebook, personality traits, privacy, social media, technology by Crystal. Bookmark the permalink.